Okay, y’all. 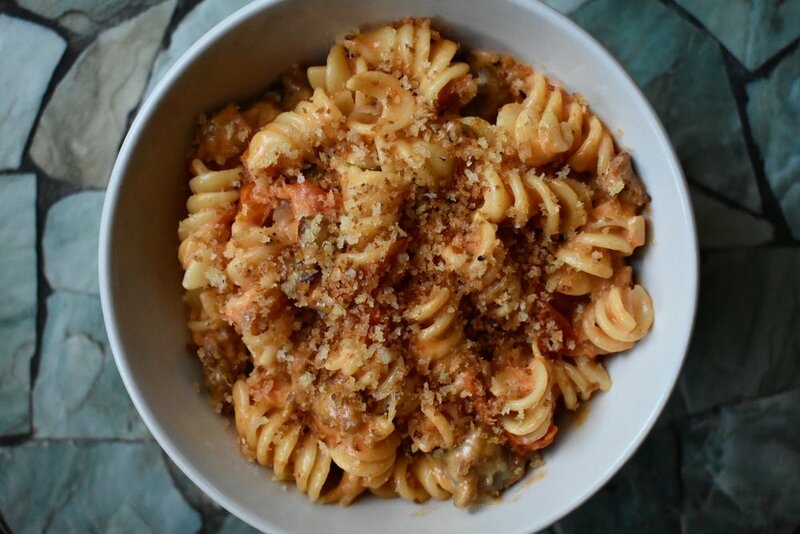 After receiving many messages about this one-pot pasta post I shared on my Instagram page a few weeks ago, I decided to write up and share this recipe! Thanks for being patient on this one. Between classes, my work schedule, and knocking out Thanksgiving prep and dinner, I’ve been running nonstop and haven’t had much time to write. Keep in mind, this recipe wasn’t much of a recipe though. It was one of those “let me whip this up because I don’t feel like spending too much money on Uber Eats after work” kind of dinners with what I had available with my pantry staples. Since it was mostly a freestyle thing that I featured on my Instagram story highlights, you can definitely adapt this how you see fit. Don’t feel like using sausage? Substitute chicken, beef, or turkey. Want to use veggies instead of meat? Sure! Want to add lots of cheese? Go for it. Use whatever pasta you have on hand laying around in the pantry. Note, that I used an entire box of pasta for this dish because I wanted to make extra pasta to have during the week, but you can definitely scale down the recipe to make a smaller serving if need be. Just use half the sausage, onion, and tomatoes for the sauce if you are. This meal comes together very quickly because by the time the pasta has had time to boil, your sauce should be done. That’s the beauty of it. You end up throwing everything together in one pot and you have a solid meal to feed a family in no time. Just have fun with it! *Reserve at least 1 cup of the pasta water after boiling. **To toast the breadcrumbs, heat them with a little oil, kosher salt, and black pepper. Set aside. To start, get a large pot of heavily salted water boiling for the pasta. While the water is heating up for the pasta, in a large pot or deep frying pan, add just enough oil to lightly coat the bottom of the pan. Add the sweet Italian sausage and cook through while crumbling with the back of your spoon or spatula. If you aren’t able to find ground sausage, you can remove the casings and follow the same steps as previously noted. After about 7-8 minutes, or once the sausage is browned and crumbled, remove from the pan to drain on a paper towel lined plate. Set aside. Next, add the diced onion to the same pan where you just cooked the sausage and sauté. Liberally season with kosher salt and black pepper. Cook for about 5-7 minutes or until the onions are translucent. Then, add the halved tomatoes and season again. Cook the tomato and onion mixture for about 5 minutes, stirring occasionally. The tomatoes should release a lot of liquid after being salted and cooked down. Use your spoon or spatula to smash the tomatoes to help them along the way. Once the sauce is looking saucy enough to your liking, add the sausage back into the mixture along with the torn basil leaves. Stir well. Then add the heavy cream and half-and-half. Fold into the tomato sauce base and continue to cook for another 5 minutes to thicken up a bit. While the sauce is working, boil the pasta according to package instructions. I would recommend cooking the pasta a little under (about 2 minutes under the suggested cooking time) so it doesn’t get too soggy with your sauce while heating it through near the end. Also, make sure to keep at least one cup of the starchy pasta water to loosen up your pasta if you need it. 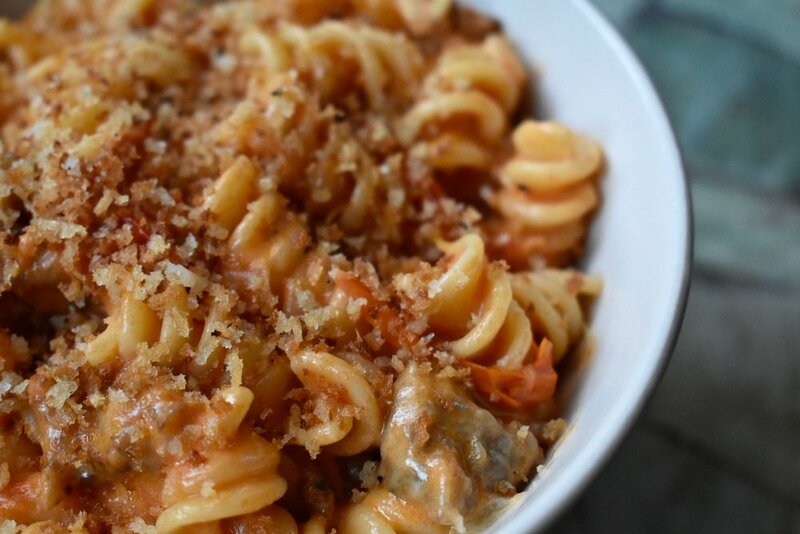 Finally, fold in the drained, cooked pasta to the creamy tomato sauce. Stir in the Italian cheese blend until it melts. Add more cream or half-and-half as you see fit. Also, add the reserved pasta water if you want to loosen up your sauce to your liking. Adjust seasonings and serve immediately. Remember, this is a freestyle kind of thing, so make it how you like! To garnish, top the pasta with toasted panko breadcrumbs and enjoy.